Did you know that nearly half of the adults living in the United States have missing teeth? We understand first hand the private pain and embarrassment you feel if you are missing one, several, or all of your teeth. As a solution to missing teeth, we can use dental implants to provide you with a beautiful, natural-looking smile. 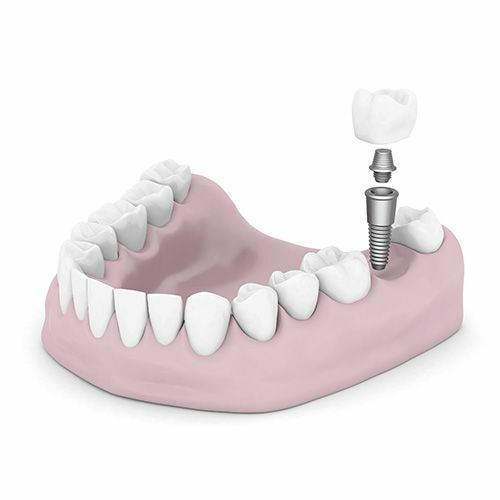 Dental implants have quickly become one of the most popular options, providing numerous benefits over more traditional tooth replacement options. At Woodyard Dental Care, PSC, we work with a surgical specialist who will place the implant post, and then we will create and place custom crowns for your final restoration. 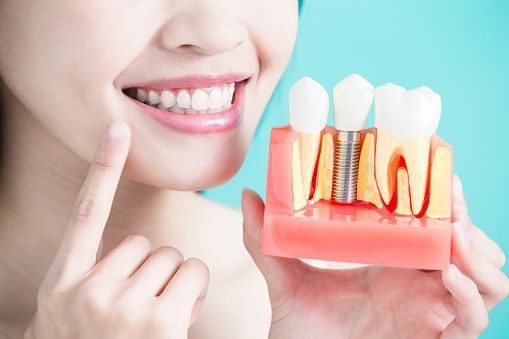 Dental implants are a fairly new addition to the options available for tooth replacement, but they yield a 96% success rate and are highly recommended as a tooth replacement option. They consist of small titanium rods, which are surgically inserted into the jawbone, and may be used in a variety of ways to replace missing teeth. This can include single tooth replacement, serving as an anchor for partials and dentures to resist movement, or even restoring the entire set of teeth. One option that we are very excited about is an option for patients who currently have traditional dentures or are faced with losing all of their teeth. It consists of replacing your missing teeth using a dental implant bridge that is fixed and permanent, with a full arch of natural-looking replacement teeth supported by dental implants. We will work with you at each step of the way, ensure that you understand all of your options, and together decide the best course of action for your unique situation. Restoring your abilities to eat and speak. Giving you back a beautiful, confident smile. The restorations are brushed and flossed, just like your natural teeth. The restorations are supported by the implants, rather than your teeth or gums. Dental Implants are the only tooth replacement option that can stop the bone loss that follows tooth loss, maintaining the strength and integrity of your jaw. Sometimes, our patients will ask us if dental implants are really worth it. It's a fair question, but we know that you've love your replacement teeth once you have them. Take a look at the before and after below from a patient who decided to get dental implants and see for yourself the difference it made for them. Just think—that could be what your smile looks like! Also look through our other smile makeovers, and see how we have transformed the lives of many of our patients. Before dental implants, this Paducah dental patient from a deteriorated smile with missing teeth. After dental implants, this Paducah dental patient's smile is bright and beautiful. What If I Don't Replace My Missing Teeth? The teeth have many functions. They are responsible for biting and chewing, which is the very first stage in the digestive process. They control the flow of air when you speak, enabling you to communicate effectively. They are essential for maintaining a healthy jaw, as without teeth the jawbone would deteriorate. The teeth are also a major component in a beautiful smile. Tooth loss affects every last one of these functions and your overall quality of life. Replacing missing teeth is necessary for restoring the functions of your mouth and your oral health. After you have replaced any missing teeth with dental implants, your mouth will look and function as if you never lost any teeth to begin with. Small holes are drilled into the jaw, and the implants are placed inside. The gums are then sutured closed around them. The implants rely on a process known as osseointegration, or the fusion of your jawbone to the implants. When osseointegration is successful, the implants become stable roots that are then used to support your new crowns. After you have healed from dental implant surgery, Dr. Jonathan Woodyard is responsible for the placement of your ceramic crowns. Why Is The Implant Placed By A Specialist? We do not place the implants. Instead, we work with a highly-skilled implant specialist who performs the implant surgery. This is a key advantage to our dental patients, as Dr. Jonathan Woodyard can work closely with the specialist to ensure that our patients get the absolute best care possible. Oral surgery is a complex science, and only high-trained oral surgeons with extra training should be trusted to place your dental implants. Once your jaw has healed after surgery, Woodyard Dental Care, PSC will take care of creating and placing the ceramic crowns that replace the visible sections of your missing teeth. 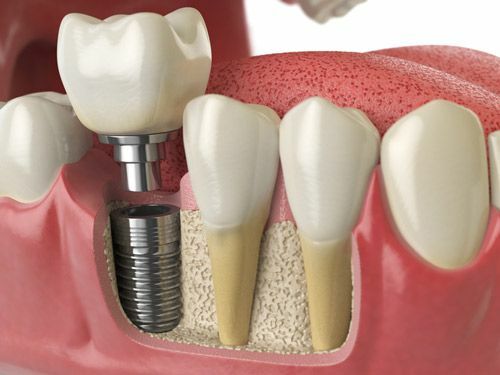 How Is The Dental Implant Restoration Created? We begin by taking a digital impression of your mouth, using the Trios 3Shape scanner. This scanner sends the impression to a computer, where we can design your new crowns in 3D. Our Trios 3Shape scanner is the only one to scan in true color. This unique feature allows us to look at the angles of all opposing or adjacent teeth, if you have any remaining, to provide a perfect color match. After we have finished designing your new crowns, the information is then sent to our in-house milling machine, the Planmill Plan Mecha. Your crowns are milled from ceramic blocks. Once finished in the machine, we trim the block, add a glaze, and fire your new crowns in the oven. Other offices need to send your impressions to a dental lab, meaning that it can take several weeks before your new crowns are ready. At Woodyard Dental Care, PSC, we can have your custom crowns ready for placement in only 2 to 4 days. The cost of dental implants ranges significantly, depending on what you need. Sometimes, only a single dental implant is necessary, and the cost is minimal. Other times, a full replacement of all teeth is needed. We specialize in affordable, durable, natural-looking tooth replacement solutions for our patients, and we will help you find a solution that fits your budget. The best way to determine any potential costs is to visit us for a dental implant consultation, where we can evaluate your specific situation, and create a plan that is custom-tailored to your unique needs. Tooth loss has many causes. You may lose teeth as a result of facial trauma, they may fall out as a result of gum disease, or you may lose them due to bruxism. Whatever the cause of your missing teeth, tooth loss has a significant impact on every aspect of your life. Eating, speaking, even smiling confidently all become incredibly difficult. Replacing your missing teeth is essential for restoring the functions of those teeth, giving you back your smile and improving your quality of life. When it comes to replacing teeth, you have a few options, partial dentures, full dentures or dental implants. At Woodyard Dental Care, PSC, we can discuss all of your options with you and help you to make the best decision for your needs. Dentures are the traditional treatment for missing teeth. They have been used for hundreds of years. The dentures used today, however, are vastly different from their earlier counterparts. Acrylic resin teeth are set into a removable, gum colored acrylic base. The base rests directly on your gums, held in place by suction, and relies on the gum tissue for support. 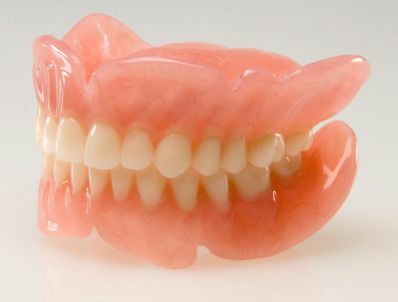 Dentures can be made to replace a full arch of teeth, a full denture, or sections of missing teeth, partial dentures. Partial dentures are similar to full dentures, with the addition of metal clasps that attach to your healthy teeth. These clasps work to provide additional support. Technological developments have improved dentures from their earlier counterparts. Today, they are less bulky and more comfortable. They restore your abilities to eat and speak. Your smile is restored, which can also give you back your confidence. Along with these benefits, dentures do have some major drawbacks. They require additional nightly maintenance, which can be tedious. They may slip out of place, which can cause an embarrassing situation. Dentures, while made from impressions of your mouth, will not always fit properly. As your jawbone changes shape, a natural occurrence following tooth loss, the denture stays the same. This means your dentures will need to be periodically replaced. Ill-fitting dentures can cause painful sores on the gums. Dental implants are a modern alternative to replacing missing teeth. Implants use small titanium posts, which are surgically implanted into the jawbone, to support ceramic crowns that replace your missing teeth. As you heal from the implantation procedure, the bone fuses to the posts, integrating them into your jaw. This process is known as osseointegration. When this process is complete, the implants are strong, stable and immovable. 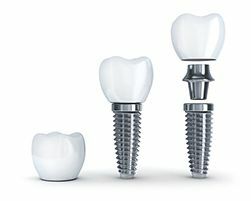 The crowns are screwed in place to the implants and are held securely in place. Because they are held securely in place, they will not slip around in your mouth. They can be brushed and flossed just like your natural teeth. They are more comfortable. The replacement teeth are supported by the implants rather than your gums. Implants stimulate the jawbone in a similar fashion to the roots of your natural teeth. This helps to prevent the bone loss that follows tooth loss. They work to maintain the health and integrity of your jawbone. Only implants can offer this benefit. While there are so many benefits to dental implants, there are still a few disadvantages. Recovery times can last several months. Implants often cost more than traditional treatments. If you do not have enough bone mass to support dental implants, you may require additional or alternative treatments. If you are missing an entire arch of teeth, you may be eligible for the All-on-4 treatment. If you are missing a section of teeth, you may need a bone graft before undergoing implant surgery. Replacing your missing teeth is essential for giving you your life back. We can help you to make the best decision for you that will provide you with the best possible results. Call Woodyard Dental Care, PSC today to learn more and schedule your consultation at (270) 213-6620. Why Do Dental Implants Prevent Bone Loss? Dental implants are implanted into the jawbone, support your replacement teeth, and yield a 96% success rate. 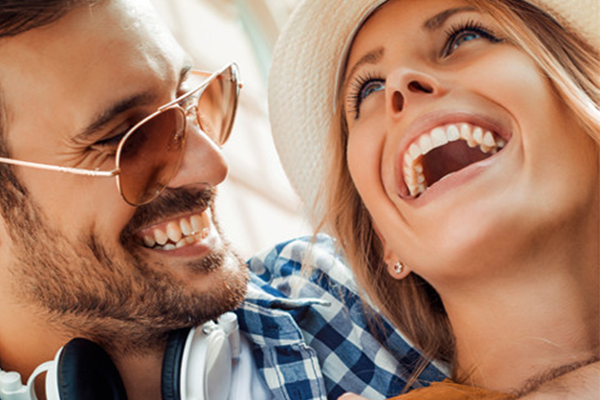 They offer numerous benefits over traditional tooth replacement options and are far superior in mimicking the strength and functions of the natural teeth. However, what makes them this way? It is all thanks to a natural process called osseointegration, and implants rely on this process for success. Many things happen after you lose your teeth. Your appearance is altered. Eating becomes more challenging. Your speech is affected, and it becomes harder for others to understand you. Under the gum line, your jawbone is affected as well. Your teeth are responsible for maintaining a strong, healthy jaw. Every time you chew, the teeth stimulate the bone. This stimulation sends a message to your body. The body responds by sending the nutrients needed for the bone. When you lose your teeth, even just one, the message begins to grow weaker. As a result, fewer nutrients are sent. Over time, the jawbone begins to grow weaker. When your jawbone is too weak, the likelihood of successful osseointegration decreases. Too little bone mass cannot provide the support that dental implants need. If implants are placed in these conditions, they are likely to fail. Thanks to continuing research and development, just because your jawbone is weak does not mean that you cannot undergo treatment with implants. There are several ways in which implants can be made possible. For instance, the All on 4® Treatment Concept makes use of what bone mass is left in your jaw. Additionally, you can undergo a bone graft, which is a surgical procedure that restores mass to your jawbone, thus providing the stability that implants need. Osseointegration is a process by which your bone mass fuses to the titanium rods that are implanted into the jaw. It was first discovered back in 1952 by a Swedish orthopedic surgeon, Per-Ingvar Bråenmark. His discovery was completely accidental and was found while he was studying bone healing and regeneration. He had implanted a titanium cylinder into the femur of a rabbit and discovered that the bone had begun to fuse to the cylinder. This led him to further research and the eventual development of dental implants. Since this initial discovery research and development have continued, and new ways to improve implants, and facilitate the process of osseointegration, are always being formulated. When osseointegration is successful, the implants become strong, stable support for your replacement teeth. They essentially become replacement tooth roots. 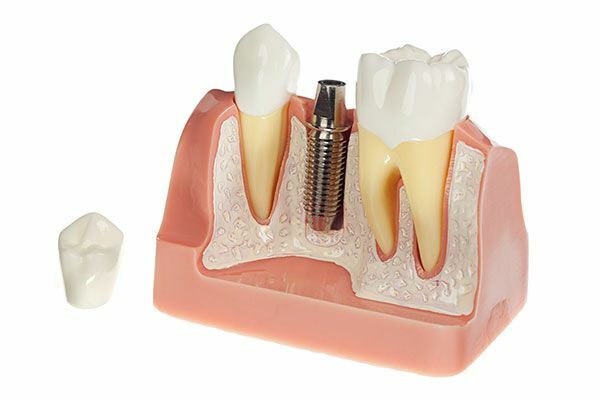 When you chew, the implants mimic the stimulation that your natural teeth provide the bone. As a result, the body begins sending essential nutrients once again. Because the stimulation of the bone is restored, your jaw remains strong and healthy. Are you ready to replace your missing teeth with dental implants and live life to the fullest again? With a successful fusion of the jawbone to the implants, your new teeth will be strong and stable. Dental implants not only restore the basic functions of your mouth, but also improve your smile and quality of life! Call us today at (270) 213-6620 for more information or to schedule your appointment.